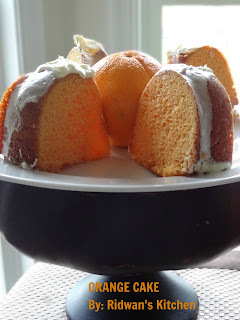 First of all I would like to say Thank you so much to Mrs,Mitchell to Share this Yummy orange cake with us,this is one of all your delicious dessert that you share with us almost every week,I appreciated, And thank you for emailed me this orange cake recipe too,so I can share it. Combine all ingredients in mixer bowl. Beat with electric mixer 3 min. Pour into Bundt pan sprayed with cooking spray. Bake 38 to 40 min. or until toothpick comes out clean. Cool in pan 15 min. Invert onto wire rack. Cool before frosting. For Glaze: Microwave icing and extract 11 seconds. stir until smooth. Drizzle over cooled cake. I should give a try to the ready available cake mix as seeing the lovely orange cake is tempting me to do so. Just like you, oranges are another one of my fav fruits. I'm also a huge fan of orange, and all citrus, in cakes. This looks delicious! I'm always down for a citrus-y cake! Looks tasty! Yum! I have never baked with orange, and I really don't know why!! I love it alone, it should be just as good in a cake. this looks like such a yummy cake= love the color and flavor. I thought this might be like the orange cake just shared at my cooking club recently, but that was made with canned mandarin oranges. This recipe is a nice version, also!